Climate change is worsening, fast. The National Climate Data Center of the National Oceanic and Atmospheric Administration has just announced that for the entire planet, 2010 is the hottest year on record, tied with 2005. 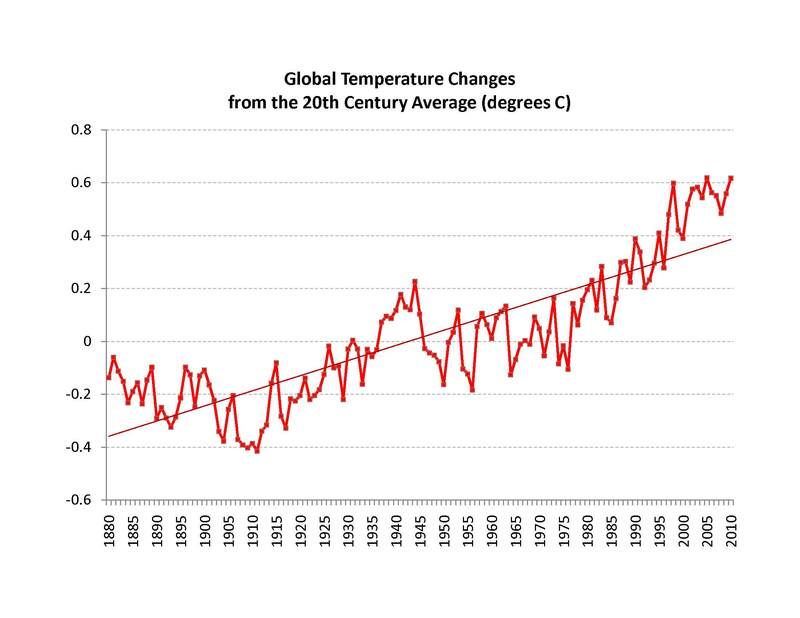 And the period 2001 to 2010 is the hottest decade on record for the globe. The actual data are here. This graph and this information should be on the front page of every newspaper in the world. Every Congressional representative should see it. And the hottest 10 years on record in order? How often do you have to get hit on the head before you say “ouch.” Or before you even say “stop hitting me on the head”? For climate deniers, probably forever. We can expect them to talk about how cold the winter is, here or there.But for the rest of us, enough should be enough. The planet has a fever and it’s getting worse. Peter Gleick: Improving Water Infrastructure with Dam Building, but for Whose Benefit? Thank you Dr Gleick for your alert and I agree with your heading – the graph should be headlined globally. Unfortunately even if it does appear, especially in Australian newspapers, it is likely to be buried somewhere between celebrity activities and sporting news. Playing ostrich and burying our collective heads in the earth does not reduce our individual and corporate contributions to climate change conditions. Although I resent having to curtail my behaviour when so many corporations are able to continue abusing our environment for profits I am using the “less is more” philosophy as my mantra for 2011. Thank you for keeping our heads above ground. As I see it, you are talking about what is happening with the climate, but saying nothing about what is causing it. No doubt the planet is getting hotter, we are getting closer to our star and will soon be the closest we have been since the dinosaurs, that is when it was really hot according to the anthropologists. I am not saying we haven’t created more of a problem, just that you should include the elliptical orbit of our planet in your article. Do I believe that a 1.2*C change is going to burn us up? Not before we destroy our selves in other ways. Climate change is upon us. The key to getting on with things in both camps is the acceptance that man made or not, climate change is here.